In yet another live export scandal, Animals Australia uncovered pregnant cows being shipped and false declarations in official reports for a shipment of cattle to Mauritius. In early October 2012, a shipload of cattle left Australia for Mauritius — notoriously the roughest of all journeys for exported animals. A shipload of cattle being tossed in heavy seas already paints a miserable welfare picture, but add to this that some of these cattle were heavily pregnant and you have an animal welfare disaster in the making. 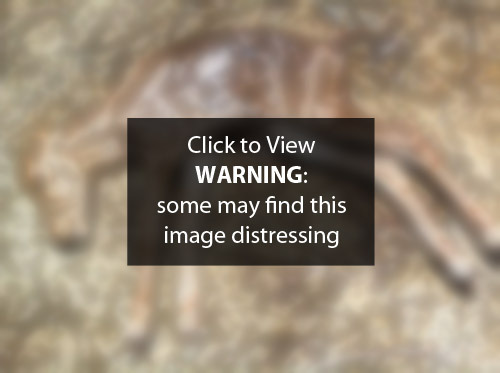 The Department of Agriculture’s investigation into this incident confirmed that pregnant cattle were exported, in breach of Australian Standards for the Export of Livestock. It was also found that the voyage report failed to record all events during the journey and the stockman did not stay to oversee the unloading of animals. The exporter – South East Asian Livestock Exports – was asked to ‘show cause’ as to why their licence should not be suspended. The Department of Agriculture ultimately accepted the corrective actions taken by the exporter, and they were allowed to keep their licence. The ship of 2061 cattle, was never supposed to include any pregnant animals. The animals were supposedly pregnancy tested before being loaded, and Australian government paperwork stated that none of the animals were pregnant. However, two cows gave birth during the voyage; four were found to be pregnant when they were slaughtered in Mauritius; and further testing revealed many others were also pregnant. Regulations require that pregnant cows are provided with additional space and bedding, but these animals received no special care, as they should not have been on this shipment. This failure to identify that animals were pregnant and exclude them from export meant that heavily pregnant animals endured the worst possible conditions during the voyage — with the stockman's report revealing heavy seas and cattle unable to rise to their feet. The two calves who were unfortunate enough to be born on board the ship were taken from their mothers and killed at sea. Animals Australia has obtained documents providing evidence that false declarations were made about the number of deaths on board the ship. Upon arrival, the ship's master declared, on behalf of the exporter, that no cattle had died during the voyage. Yet a separate report lodged by the Australian exporter several days later stated that 18 animals had died en route. This is not the first time there has been evidence of misreporting of mortality figures on ships. Upon hearing of these breaches, Animals Australia sent a veterinarian and investigator to Mauritius. On arrival, they confirmed that pregnant animals had been shipped in contravention of regulations. But a visit to the slaughterhouse also revealed that Australian cattle were being subjected to roping and hoisting prior to having their throats cut — cruel practices that cause immense stress and pain to the animals. For exporters to continue to ship animals to such appalling slaughter methods despite the public outcry over Indonesia is disgraceful. It's illegal to slaughter pregnant cows in Mauritius. So, many of these animals had been waiting in limbo at a feedlot since their arrival. But Mauritian authorities are now investigating the recent mysterious deaths of 65 of these cattle, with the importer alleging foul play. The death of these unfortunate animals was wholly avoidable. They should never have been sent to Mauritius in the first place. Once again the 'system' failed to protect the welfare of Australian animals, and exporters have been caught out sending animals to the cruellest of circumstances. With every incident we expose and every email, letter and phone call to MPs, we take a step towards ending this cruel trade for good. Click here to urge your MP to support an end to live export.